We had another very productive week on the golf course with the restoration project. This picture shows the crew going at it with all hands on #18. The bunkers against the ridge here are highly visible and they are screaming to be dramatic in nature. Nick Schaan was here again this week and with his direction, we really got aggressive with these. At this moment we still have some sod to lay here so I cant show you how they turned out yet. 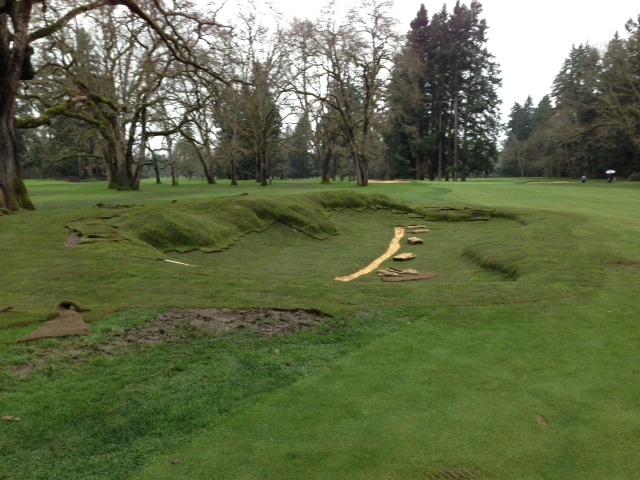 This weekend we will finish the fairways bunkers on #18 and the fairway bunker on #10 which is seen below here. That's Nick with the paint gun. Late last week we finished up #5 fairway and the first bunker on #9. Here is a great pic of #5, but I will say it does not do it justice. When your standing here in that spot you hope to hit your drive, it sets up as one of the best looking approach shots I've ever seen. 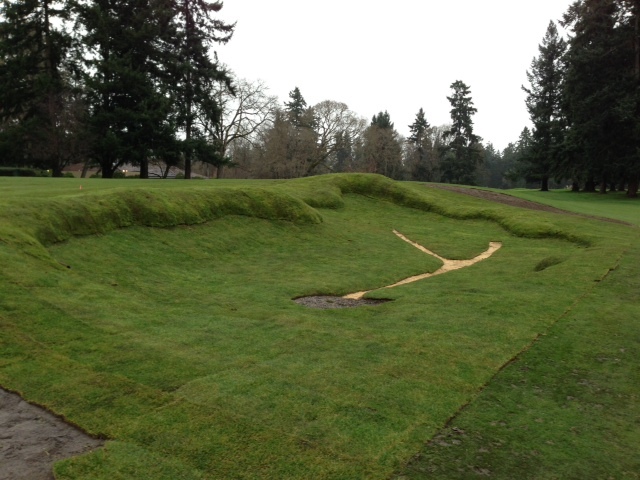 Now here is the new bunker on #9 fairway. This one is unique in that it was built on a downhill slop. This meant it had to get pretty deep for the floor to slant properly. It is a very good looking hazard but the depth of it concerned me a little so we added some interesting features to make it a little easier to get in and out of. From this angle you can see that we cut in a little goat trail in the fescue face for those that want to get in and our of it from the high side. From this point of view you can see that we cut in a little step on the low side. Both of these features will become less noticeable once the grass grows up a little, but those that play frequently will know they're available. This is the shared teeing ground for #7 and #17. It continues to develop as more and more soil gets imported. This week we break into the bunkers on #17 green where I believe we will find enough fill to finish the grade here. I can't wait to see how this turns out. With all that's going on, we still found time to start cutting in the final shape of the teeways which is producing some very nice short mowed sod for finishing up some of the bunkers we built weeks ago. For example, below is left of #7 fairway where we expanded the fairway cut up close to this new bunker. It feels really good to have some of these bunkers 100% sodded. Now all we need is sand which is coming sooner than you might think. 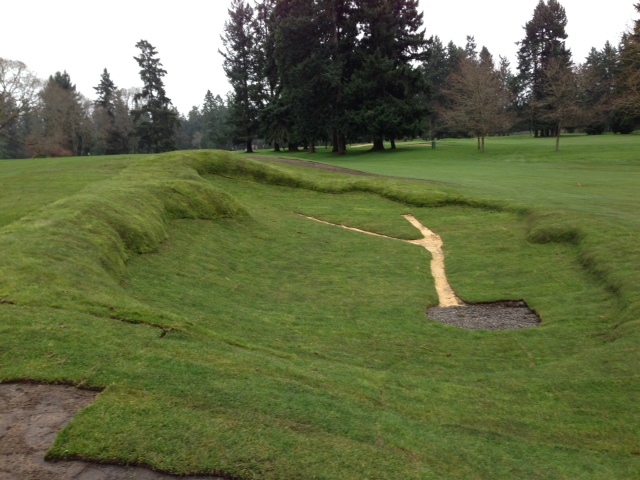 Despite being winter time, we are getting some rooting of the sod and once that happens, it will be soon that we spray out the sod liner and install the bunker sand. If you're getting tired of the course being under construction, I'm sure you're not alone but I'm excited to say that as of today, we have finished 23 of the 47 bunkers so we are half way through it. The good news is the membership has spoken loudly with an overwhelming vote of "yes" to finish it before next spring. So we will continue to press on full steam ahead, and that means you'll continue to see these updates for several more weeks. Here's the fairway bunker on #10. This bunker was pulled out away from the oak tree about 20 feet and therefore is more in play. A 270 yard drive from the champ tee will carry it but everyone knows hitting driver on #10 is usually a foolish decision. but this is what you see if your in it..................if you're lucky, you may see the top of the flag..........This is when you pick out a tree in the horizon and just commit to making a good swing at it...............remember on your next round to just stay out of it.